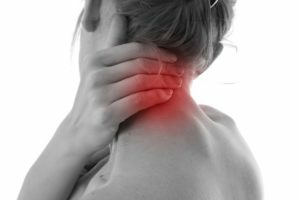 Cervical spondylosis is a common condition that Perth chiropractor, Dr Adam Rocchi, sees at Spine Scan’s clinics in Mt Pleasant and Scarborough. While the condition is a chronic one, chiropractic care can often give you relief from pain and help with strengthening your neck. It’s an age-related condition that affects the discs and joints in the cervical spine, which is the neck. Other names for this condition are degenerative osteoarthritis, cervical osteoarthritis or arthritis of the neck. The cervical spine is the seven delicate, small vertebrae that form your neck. They are positioned immediately below your skull. In this condition, the edges of your vertebrae usually develop bone spurs known as osteophytes. Over time, your discs become thinner, and their capability of absorbing shock is lost, which increases the risk of symptoms. Your swollen neck joints (facet joints) can pinch or press your spinal cord or the nearby nerve roots, leading to “pins and needles” or tingling in the extremities and at times even pain in your limbs. You might also experience loss of coordination and feeling. In some cases, those suffering from this condition may have difficulty walking. Generally, most people will experience degenerative changes as they’re growing older. According to the American Academy of Orthopaedic Surgeons, the condition is present in over 85% of individuals aged 60 years and above. Some hobbies or occupations involve heavy lifting (like construction work) or repetitive movements. This can end up putting extra pressure on your spine and lead to early wear and tear. The tough cords connecting the spinal bones in your body to each other can get stiffer over time. This affects your neck movement, making your neck feel tight. If you have had a previous neck injury (for instance, during a car accident or a fall), this can speed up the ageing process. Your spinal discs can start developing cracks. This will allow leakage of your internal cushioning material. The material can press on your nerves and spinal cord, leading to symptoms like arm numbness and pain that radiates down your arm. There are discs between your spinal bones; the discs are thick, padlike cushions that always absorb the shock of twisting, lifting and other activities. Over time, the gel-like material found inside the discs can dry out. As a result, your bones (spinal vertebrae) will rub together more than before, which can be painful. Smoking may increase the risk. Also, some researchers claim that there is a genetic cause since cervical spondylosis sometimes runs in families. Standard medical treatments for this condition involves relieving the symptoms. There’s no way of reversing the effects that cervical spondylosis has on your body so treating stiffness, pain and other issues that often accompany this condition is the course that’s taken. Depending on your symptoms, treatment may include bed rest, warm compress, using an ice pack and low impact workout as you can handle it. Your GP may recommend to have analgesics or NSAIDs (nonsteroidal anti-inflammatory drug), a drug class that prevents blood clots, decrease fever, reduce pain and decrease inflammation, in higher doses. In cases where your pain is severe and difficult for you to manage, some patients take a muscle relaxant, steroid or narcotic pain killers. In severe cases, spinal injections or surgery may be suggested. Some common surgeries for this condition include spinal fusion, invertebral disc annuloplasty and intervertebral disc arthroplasty. In some cases rigid orthoses or soft collars may be recommended for providing support. However, these methods are not effective and any benefit you receive is mainly because of a placebo effect. They also result in weakening of your neck muscles over time making the problem worse. Medications have been seen to have unpleasant side effects; some medications can even be harmful to your body. Different NSAIDs have been linked to heart disease, stomach ulcers and kidney problems. Some prescription pain medications can be addictive. Also, surgery should be the last resort because of the time it takes to heal, the invasiveness of the procedure and the potential complications. People often seek other forms of treatment available that are gentler on the body and 100% natural. That is why chiropractic is the preferred treatment for cervical spondylosis. Chiropractic is the ideal treatment for this condition. Many people gravitate toward it because it’s non-invasive and doesn’t use harmful medications. This popular treatment is natural and the whole body approach is what makes it an appealing method of treatment. Besides spinal adjustments, your chiropractor may work on the muscles as part of your neck pain treatment as a method of relieving stiffness. Dr Rocchi uses the Trigenics system for muscle work which helps relieve pain and improve mobility almost immediately. Also, your chiropractor may recommend lifestyle changes, stretching, dietary modifications, rest and ice or heat. You may also be advised to remove certain foods from your diet that often increase inflammation. Additionally, you may be taught special exercises that will help keep your neck supple. Your chiropractor may also advise you to take special supplements that will help with your body and enable its natural capability of healing itself. Dr Rocchi uses the Pulstar Spine Scan tool that can provide relief for your neck pain. This tool helps in assessing the degree of fixation or motion of your spine and delivers a specific adjustment to restore normal movement and relieve pain. Start by keeping your body straight. Then, push your chin forward towards your chest and hold this for five seconds. Next, return your head to the centre position. Then move your head back, and hold for five seconds. Carry out five repetitions. Start this exercise by leaning your head down towards one of your shoulders, leading with your ear. Hold this for five seconds. Return your head to the centre. Next, repeat on the other, then carry out five repetitions.